Halkozine, Copper-glance (copper brilliance), is a sulfide of copper. Glance (glitter, glare) metallic, opaque. Colors leaden-grey. A line is darkly-grey. Fracture, break padman, uneven. Cleavage noperfect absolute. 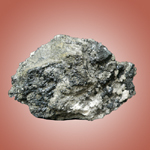 Be found in the area of cementation of sulfide copper deposits and in cooper slates. Crystals (rhombic Crystal structure) are rare, more frequent dense aggregates and earthy the masses. Important copper ore. Deposit minefield mine field occurrence subsoil: Germany, Spain, Yugoslavia, England, CIS, Shaba (Zaire), Namibia, USA. 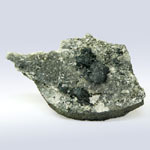 Other name - chalcosite. Be found as pseudohexagonal crystals, appearing at a double. Has prismatic or plate tablet lamellar forms. Crystals are often with shading. Colors grey ferrous, with dark brilliance. On air darkles easily. At a temperature above 91oC passes to hexagonal modification. Chemical composition (chemistry, compound). Copper (Si) 79,8%, Sulphur, Sulfur, Brimstone (S) 20,2%; admixtures: silver, cobalt, nickel, arsenic, gold. Form of crystals. Rare thickplate tablet lamellar and shortcolumnar, basaltiform crystals. Crystalline structure. Very difficult. Class of symmetry. Rhombo-pyramidal - mm2. Relation of axes. 0,436 : 1 : 0,492. Cleavage. Very noperfect absolute to on (110). Aggregates. Continuous, fine-grained. 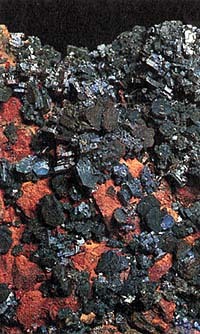 Often is with other minerals of copper as dense mass. 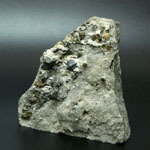 Exceptionally similar with chalcosite digenite, jarleite and anilite. Flame of gas-ring paints in a green color, a sulphureous anhydride is here selected. Fuse melt, painting flame in a dark blue color; on coal the kinglet of copper gives with a soda. Be found together with a native copper; their joint finding - usually in the area of the second sulfide enriching. Presented also in hydrothermal vein, lode, mines and in basic sediments deposits in tufa, tuff, sinter and sandstones. Magnificent crystals are known in Kornuolle, on Ural, in Germany, from Yoakhimstal in Bohemia, from Cu-meba in Namibia, and also on the main world deposits of copper (Mexico, Peru, Chile, Spain, USA). In Italy be found mainly in Montekanini Val-de-Chechina (an area Toskana) and in Kalbona (Sardinia).